Gardening in Toronto: HGTV Canada finally airs some GARDENING programs! HGTV Canada finally airs some GARDENING programs! On Mondays at 10:30 p.m. they’re running a show called Petal Pushers. Supposedly it’s a behind-the-scenes look at a florist’s shop. I expect that most/all of it is staged (I can’t imagine anyone could be so nasty to their customers and maintain a business—wait, actually, yes, I have been in a florist like that on St. Clair West, so maybe it’s more realistic than I give it credit). The best part of it all, for me, is seeing how they construct the arrangements. The arrangements aren’t high-end floral competition style (i.e. 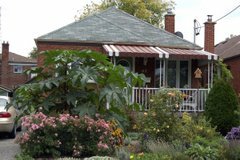 Canada Blooms), but are interesting and offer some insights for those of us arranging for home and local hort society competition. The better gardening show is Around the World in 80 Gardens. This BBC documentary-style program promises to showcase 80 spectacular gardens from around the world, over the course of its run. I haven’t caught every episode, but have thoroughly enjoyed the ones I have seen. They are, of course, on a scale far more grand than I could ever hope to garden personally (New York’s Central Park, anyone? ), but it’s good for vacation destination ideas and some garden escapism. Around the World in 80 Gardens airs Fridays at 10:00 p.m.